While there are many types of toothpaste that contain whitening agents, they are not nearly as effective as other whitening treatments. These other treatments include over-the-counter whitening treatments, such as strips and trays that contain gels with varying levels of hydrogen peroxide or carbamide peroxide, the active whitening ingredient. Of course, the treatments that you receive at your dentist, who uses products with professional strength whitening agents, can yield even better results. This adage about using fruit, specifically lemons or strawberries, has a small amount truth to it. The acid that is contained in the fruit can lighten the color of your teeth. However, it does so by eating away at the layers of enamel on your teeth. This eroding of your enamel can cause permanent damage to your teeth and is a harmful side effect of any whitening that may occur. It is best to wait until the pulp in the tooth has fully matured, usually in the early teens, so that there will be less sensitivity. Whitening children’s teeth too soon can damage the live tissue inside the teeth and irritate and sensitize gumlines. The teeth whitening products that are available in stores and the procedures that you undergo in your dentist’s office will all be effective on natural teeth. However, with veneers and crowns, which are composed of porcelain or some other similar synthetic material, these treatments and procedures will have no effect. The color of the dental prosthetic will remain the same color as when they were first placed in your mouth. If you want them to match the new, whiter color of your teeth, you will have to replace them with new ones that are colored in the appropriate shade. There are numerous teeth whitening products available that can help you whiten your teeth to the shade that you prefer. However, the outcome that you get does lose its effectiveness. If you do not reapply a teeth whitening application, your teeth can gradually turn yellow. This is because as you age, your teeth tend to turn yellow naturally. Maintaining whiter teeth as you age can require the occasional reapplication or touch-up of a teeth whitening product or procedure. 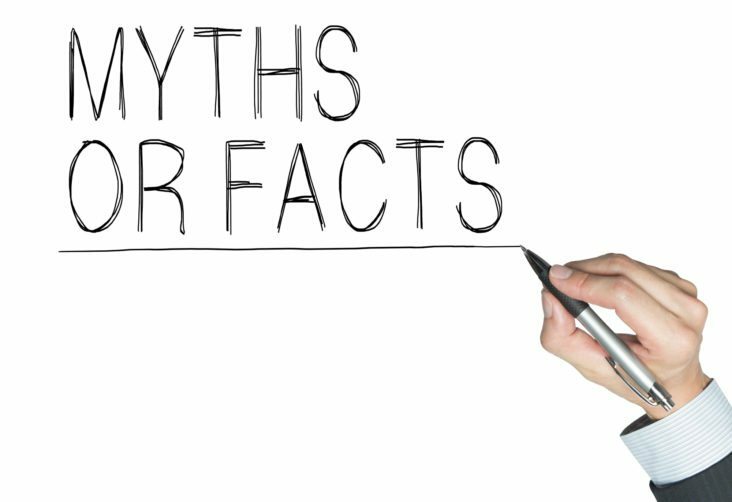 Take care as you consider your teeth whitening options and be aware of the misleading myths that surround the treatment that can cause you to compromise your oral health. Do your research, and always speak to your dentist before starting treatment. The most popular cosmetic dental procedure today is in-office teeth whitening. With this procedure, you can be in and out in under an hour with your teeth looking pearly white. Your smile will rival a movie star after this type of treatment. There are plenty of benefits for this procedure when compared to the home remedies and solutions on the market today. The biggest advantage is that you will be getting treatment from a professional. You won’t have to try and understand complicated instructions squeezed onto the side of a tube. Instead, you can trust your teeth in the hands and under the expertise of the dentist. They know exactly how to get your teeth looking bright and beautiful. You won’t have to worry and instead you can sit back, relax and wait for the procedure to be completed. Do you need your teeth whitened for an event or a special occasion? Perhaps, you have a big business meeting in a few days, and you want to look your best. With an in-office treatment, results will be fast. This is not a guarantee if you use a home remedy. With a home remedy, it can take weeks for a noticeable effect. If you use an in-office treatment, you’ll see changes in just a couple of hours. There has been some controversy over whether teeth whitening is safe. Specifically, when using home treatments and gels. Rest assured, with an in-office treatment you can guarantee that the substances used are controlled. They have been tested to ensure that there is no danger to your teeth or your oral health. Again, you’ll be putting the safety of your teeth in the hands of medical professional who will complete the treatment for you. Sensitive teeth might have stopped you from getting a teeth whitening treatment in the past. Now, you can feel confident with an in-office procedure. The use of desensitizers can reduce any discomfort that you might have experienced. In fact, it can feel no different than the sensation that you get when you brush your teeth. Using a home treatment can mean that you regularly have to apply the substance to see any effect. With an in-office treatment, the situation is completely different. One treatment will have a noticeable effect and will last for months. You won’t have to continually return to get another treatment to keep your teeth white and shiny. Over the years, you might have stained your teeth with marks that you thought were permanent. Drinking coffee or smoking can leave marks on your teeth that won’t come off through cleaning. In-office professional treatment for whitening is the only way to get rid of these stains. Once you do, you’ll have confidence in your smile again. You won’t have to worry about nasty, unsightly marks on your teeth. Say goodbye to tooth stains and hello to a younger looking smile with in-office whitening. Undergoing a professional teeth whitening treatment can help restore a youthful, healthy appearance to a person’s smile. Unfortunately, some people who use store bought kits take teeth whitening too far, and the result is an unnaturally bright smile. There’s nothing wrong with wanting a whiter smile, but it’s important that people don’t overdo a good thing and possibly cause damage to their teeth. It’s common for a cosmetic dentist to have to remove previous cosmetic treatments such as veneers, bonding or crowns because they have an unnatural appearance. The reason for their unnatural appearance is usually because the dentist who places them didn’t take advantage of today’s innovative technology, materials, and techniques and the results were smile enhancements that appeared fake. All patients desire a natural look to their cosmetic enhancements, and it’s easy to achieve with a professional, experienced cosmetic dentist. Age – The appearance of a natural white smile varies with age so what’s natural for a 30-year-old isn’t the same as for a 60-year-old. With normal aging, teeth become duller and discolored and bleaching too light for a person’s age comes off as fake. Current shade of teeth – Whitening teeth to the point where they’re as white as they can go should never be the goal of a treatment because it won’t look better, it will look unnatural. Opting for a professional in-office teeth whitening ensures that the dentist brightens teeth to a shade that’s appropriate for the patient. Natural complexion – A patient’s teeth and their natural complexion should share similar undertones to achieve a natural look. An experienced cosmetic dentist knows exactly how to whiten teeth to match a person’s skin tone. To keep a newly brightened smile looking lustrous and healthy longer, patients should avoid drinking colored beverages that can stain or, at least, rinse after consuming them. Another way to avoid drink stains on teeth is to drink through a straw when appropriate. When a patient has their teeth brightened to a degree that complements them and flatters them naturally, they’re eager to share their smile with the world. Creative Dental offers teeth whitening that’s effective, safe, fast and caused minimal teeth sensitivity. Contact us today to find out how to achieve a brighter, more youthful smile.